Nothing poses a greater long-term risk to your home’s value than a wet basement. If left unchecked, basement moisture can ruin floors and walls, encourage mold, even damage roofing. Some wet basements are easy to cure, simply by making sure gutters stay clear and by diverting gutter water well away from the foundation. But if the problem comes from other sources—water flowing toward the house on the surface, seeping in from underground, or backing up through municipal storm drains—you’ve got to take more aggressive action. 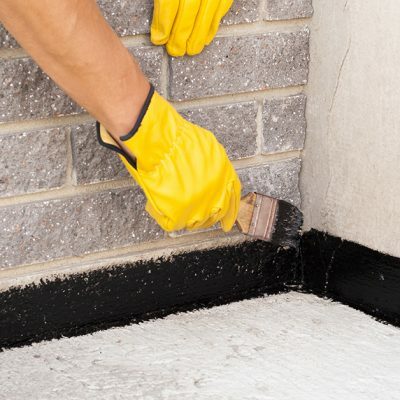 Here’s help with figuring out what may be causing your water trouble, and eight basement waterproofing strategies to try, from the simplest and least expensive to the most challenging and costly. If downspouts are dumping too close to the house, you can get water the recommended five feet or more away from the foundation by adding roll-out plastic or metal gutter extenders. But they aren’t the neatest or most effective long-term solution, especially if you’re likely to trip on them or run over them with a lawnmower. Permanent underground piping is invisible and capable of moving large quantities of runoff much farther from your house. For about $10 a foot, a landscaper or waterproofing contractor will dig a trench and install piping to carry the water safely away. If you see water dribbling into the basement through cracks or gaps around plumbing pipes, you can plug the openings yourself with hydraulic cement or polyurethane caulk for less than $20. Plugs work when the problem is simply a hole that water oozes through, either from surface runoff or from wet soil. But if the water is coming up through the floor, or at the joint where floor and walls meet, the problem is ground water, and plugs won’t do the trick. For that, see Solutions #5 though #7 below. If the gutters are working and you’ve plugged obvious holes, but you still see water dribbling into your basement or crawl space from high on the foundation walls, then surface water isn’t draining away from the house as it should. Your house should sit on a “crown” of soil that slopes at least six inches over the first 10 feet in all directions. Over time, the soil around the foundation may have settled. All you need to do to build it back up is shovel in more dirt. One cubic yard of a water-shedding clay-loam mix from a landscape supply house costs around $30 (plus delivery) and is enough for a two-foot-wide, three-inch-deep layer along 57 feet of foundation. If you can’t add soil without bringing it too close to the siding—six inches is the minimum safe distance to protect against rot and termites—then you may be able to redirect surface water before it reaches the house by creating a berm (a mound of dirt) or a swale (a wide, shallow ditch). In small areas, berms are easy; a landscape contractor can build one for a few hundred dollars. On bigger projects, berms make less sense because you’ll have to truck in too much soil. In that case, dig a swale (about $1,000). Once landscaping grows in, berms and swales can be attractive features in your yard. If water is leaking into your basement low on the walls or at the seams where walls meet the floor, your issue isn’t surface water, it’s hydrostatic pressure pushing out water within the ground. The first thing to do is check whether you have footing drains, underground pipes installed when the house was built to carry water away from the foundation. (Look for a manhole or drain in the basement floor or a cleanout pipe capped a few inches above the floor.) The drains may be clogged, in which case you can try opening the cleanout and flushing the pipes with a garden hose. If that doesn’t work, a plumber with an augur can often do the job for about $600. If you don’t have footing drains or can’t get the existing ones to function, there’s one more thing you can try before you invest in a costly interior or exterior basement waterproofing system: Install a curtain drain to divert water that’s traveling underground toward your house. A type of French drain, a curtain drain is a shallow trench filled with gravel and piping that intercepts water uphill of your house and carries it down the slope a safe distance away. If you can’t keep subsurface water out, then you have to address it on the inside. To create an interior drain system, crews saw a channel around the perimeter of the floor, chip out the concrete, and lay perforated pipe in the hole. The pipe drains to collection tank at the basement’s low spot, where a sump pump sends it away. Starting at about $3,000, an interior system may be the least expensive and disruptive option if you have an unfinished basement with easy access, or a lot of mature landscaping that digging for an exterior system would destroy. Installing an interior drainage system gets the water out but doesn’t actually waterproof the walls. For that, you need an exterior system: a French drain to relieve hydrostatic pressure and exterior waterproofing to protect the foundation. It’s a big job that requires excavating around the house, but it may be the best solution if you have a foundation with numerous gaps where water is getting through. It also keeps the mess and water outside, which may be your choice if you don’t want to tear up a finished basement. The downside, besides a price tag that can reach $20,000, is that your yard takes a beating, and you may need to remove decks or walkways. Need help with your wet-basement? Contact Toledo Basement Repair today for a fast and friendly repair estimate! Article From Houselogic.com, By: Jeanne Huber, Published: August 28, 2009. Jeanne Huber is the author of 10 books about home improvement and writes a weekly column about home care for The Washington Post. She solved her first drainage mystery when her family’s frequent sneezing attacks led her to discover mildew coating the underside of their house’s roof. Turns out basement flooding (see Sign #6) was to blame.